Our premiere one day trip ideal for people with a day or two to spare when visiting Nairobi, or those basing themselves in the capital (only 100km’s along the Nyeri Road). This will be an exciting day of thrills (and often spills) with a great mix of high action whitewater (up to grade V) interspersed with scenic calm water where birdlife abounds. Not enough? Why not leap feet first into a big surfing hole, jump a 30ft waterfall or swim ‘The Devils Toilet Bowl’ (water level dependant). Other options available on the Tana include scenic float trips from the camp downstream on completely flat water for those not wishing to experience any whitewater. This trip lasts 4hrs and takes in the abundant birdlife inhabiting the lush riverine forests along the river. To date our guides have recorded over 120 species of birds on this section. 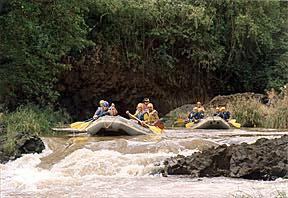 Trips are usually taken by a Kenya Professional Safari Guide.